Boston, MA ( Sept. 17, 2007)— InHand Electronics, Inc. (Rockville, MD), a leader in handheld and wireless device platforms for OEMs, the Natick Soldier Research Development and Engineering Center (Natick, MA) and Army Research Lab, Sensors Electronic Device Directorate (Adelphi, MD), today announced at the Embedded Systems Conference the completion of the first general-purpose, military-grade PDA utilizing low-power, flexible display technology. The Soldier Flex PDA (SFPDA) has been successfully demonstrated at the Future Force Warrior’s On-The-Move (OTM) exercises in Fort Dix, NJ. The SFPDA, developed in collaboration with industrial design firm Artisent, Inc. (Boston, MA) and advanced display technology firm E-Ink Corp. (Cambridge, MA), utilizes next-generation flexible display technology from the U.S. Army Flexible Display Center (FDC) at Arizona State University. Whereas the electronics for most PDAs are challenged to run under 1W, the entire SFPDA has typical power consumption well under 1W, including the display and InHand’s PXA270-based Fingertip4 CPU board, along with Ethernet, USB, Bluetooth, and keypad interfaces. This reduced-power consumption is due to the unique low-power characteristics of electronic paper displays and InHand’s patented BatterySmart system software. 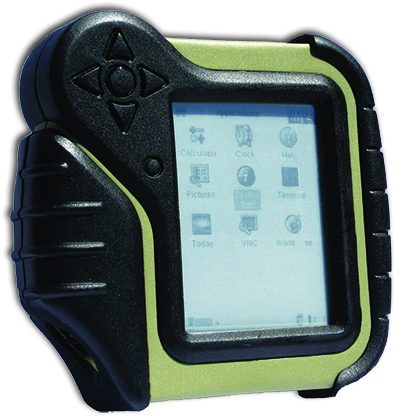 The result: a ruggedized handheld with over 6 hours of run-time weighing in at less than one pound. The SFPDA will be displayed at InHand’s booth (#1213) at the Embedded Systems Conference at Hynes Convention Center in Boston, MA (Sept. 19, 20). More information on the Natick Soldier RDE Center can be found at www.natick.army.mil. More information on Fingertip4, BatterySmart, and InHand’s extensive portfolio of power-reducing hardware and software technologies can be found at www.inhand.com. InHand Electronics, Inc. is a leading provider of low-power embedded system-level software and hardware platforms to Original Equipment Manufacturers. InHand provides run-time power management software and hardware/software solutions to developers of handheld and wireless devices, such as cellular telephones, PDAs, wearable computers, and smart sensors. The company’s products are used in a variety of industries, including military, healthcare, entertainment, and instrumentation. InHand’s Fingertip, Elf, and BatterySmart products are built on industry-leading technologies such as Marvell’s PXA processors and Linux and Microsoft’s Windows CE operating systems. The company’s headquarters are in Rockville, Maryland. For more information, please visit the company web site at www.inhand.com. The Natick Soldier RD&E Center (NSRDEC) is located at the U.S. Army Soldier Systems Center in Natick, Massachusetts, under the Army’s Research, Development and Engineering Command (RDECOM). Natick Soldier RD&E Center has the dedicated mission to maximize the Warrior’s survivability, sustainability, mobility, combat effectiveness and quality of life by treating the Soldier as a System. Situated near the birthplace of the Nation’s Army, Natick Soldier RD&E Center is also the birthplace of the Soldier as a System concept. Natick Soldier RD&E Center’s Mission is to Maximize the Warrior’s Survivability, Sustainability, Mobility, Combat Effectiveness and Quality of Life by Treating the Warrior as a System and to deliver world class research, development, systems engineering and services, with a unique human-centric focus.